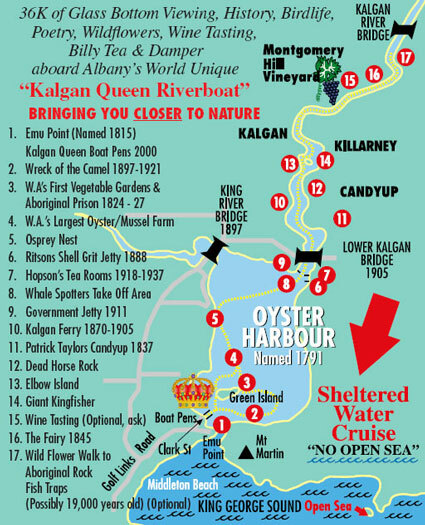 Albany Australia WA Tour map for Kalgan Queen and Albany Wagon Tours. Prices shown are "direct bookings only"
Bookings are Highly Recommended to avoid disappointment! These times and prices are valid from November the 1st 2016 until the 10th of June 2019 for. "Direct bookings only" 08 9844 3166 Plus you talk to a real person. Australian Senior's on presentation of an Australian Senior card 65 year's old and over $85. Children 4 to 14 quiet well- mannered children and young adults $60. Disruptive children may be asked to leave. "We are on a boat" I am not politicly correct, but I am however the Captain. Family ticket 2 adults and 2 children $270. Kalgan Queen and the Incredible Journey. Click here for more Cruise information and pictures. Click above for a free 15 second cruise, then for $95 go for four hours. Albany Clydesdale's no longer avaible. Billy Tea, Coffee & Captain Kalgan’s famous HOT DAMPER with a humorous yet comprehensive commentary you can see and learn more about Albany it’s history and wildlife in 4 hours than some people do in a life time! Wild Kangaroos up close and personal.